It seems as though there’s always a new tool coming along that we all just ‘gotta have’, and for the most part, that’s usually an over-exaggeration of the truth. With that said, I’d like to introduce you to a tool that is actually useful! 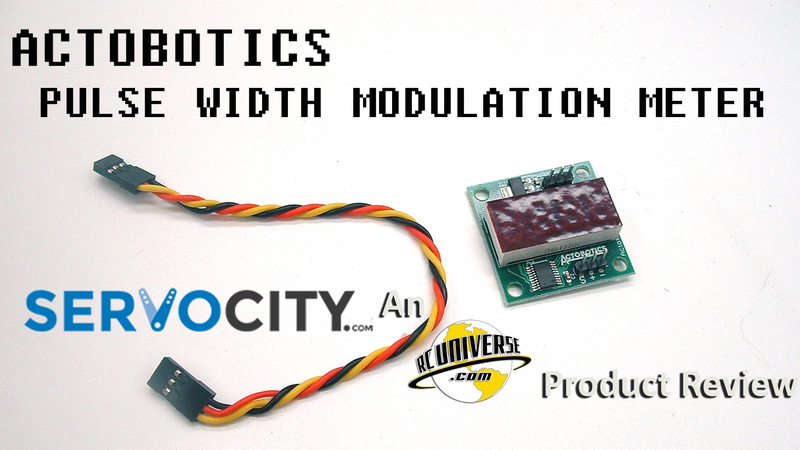 This is the new Pulse Width Modulation Meter available from Servocity.com. Now, some of you may be thinking, “What on earth am I going to do with this meter?”, while others may be thinking “What on earth is Pulse Width Modulation?” Both are excellent questions! Interested? Read on! From Technopedia.com: Pulse-width modulation (PWM) is a modulation process or technique used in most communication systems for encoding the amplitude of a signal right into a pulse width or duration of another signal, usually a carrier signal, for transmission. 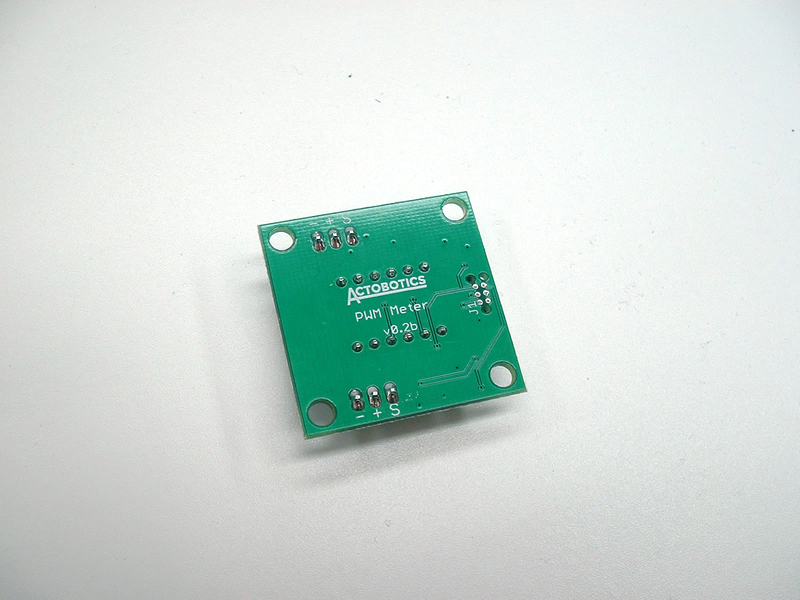 Although PWM is also used in communications, its main purpose is actually to control the power that is supplied to various types of electrical devices, most especially to inertial loads such as AC/DC motors. OK… What Does That Mean In The RC Hobby? To boil that down a bit farther, it means that the direction and distance a servo moves is determined by a digital signal. That signal is called Pulse Width Modualtion (PWM). ThePWM is spilt into two parts – a positive voltage and a neutral – and it’s measured by what is called a Duty Cycle. The longer the duty cycle, the farther the servo output arm moves, while the shorter the duty cycle, the servo output arm moves in the opposite direction. 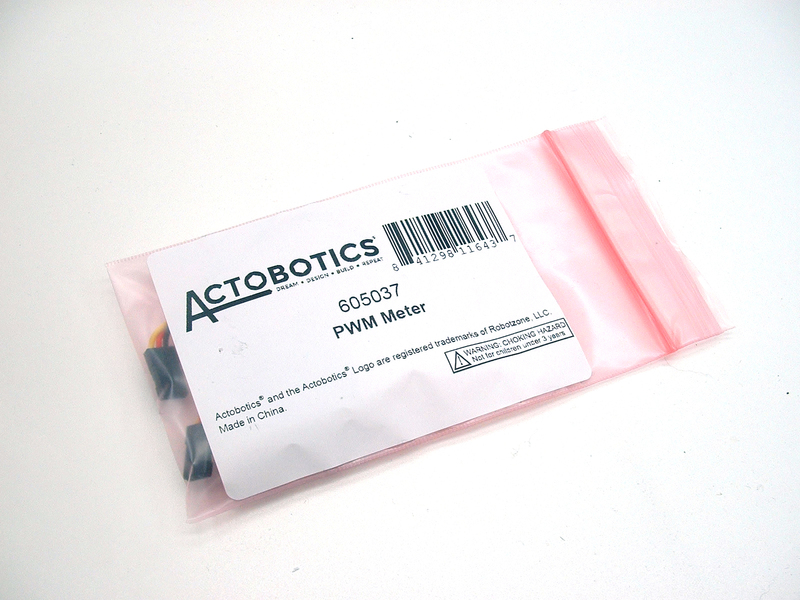 There’s not much in the way of packaging included with the PWM Meter – Then again, not much is needed! Inside the resealable bag, I found the PWM Meter and a short servo wire extension. The face of the meter has a four digit readout, which will display any number between Zero and 9,999 microseconds. The backside of the meter gives a good indication of the high quality soldering done on the board. There’s no manual included, but it’s a straight forward operation. 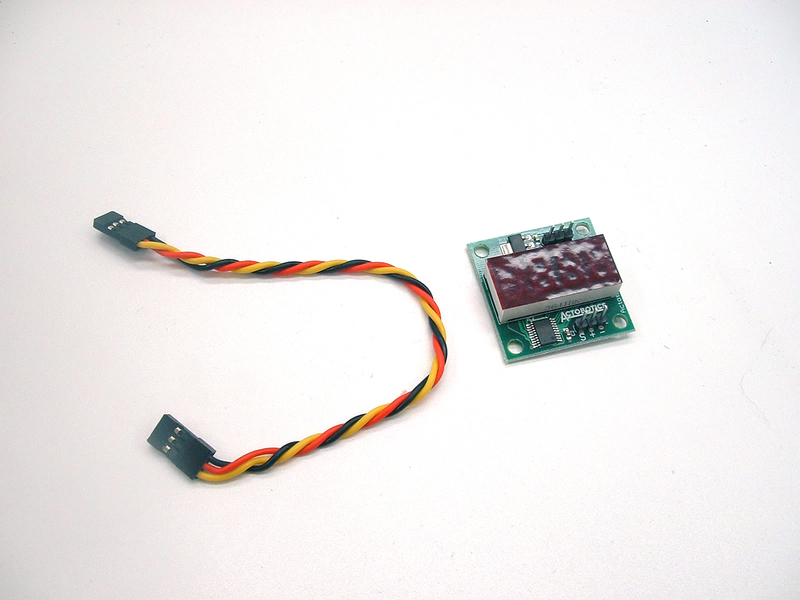 The servo and receiver can be connected to either side of the meter without any fear of harming the PCB (Printed Circuit Board). Because the three-pronged servo connectors are not polarity protected, there are printed indicators of Positive, Negative and Signal input on both connectors. 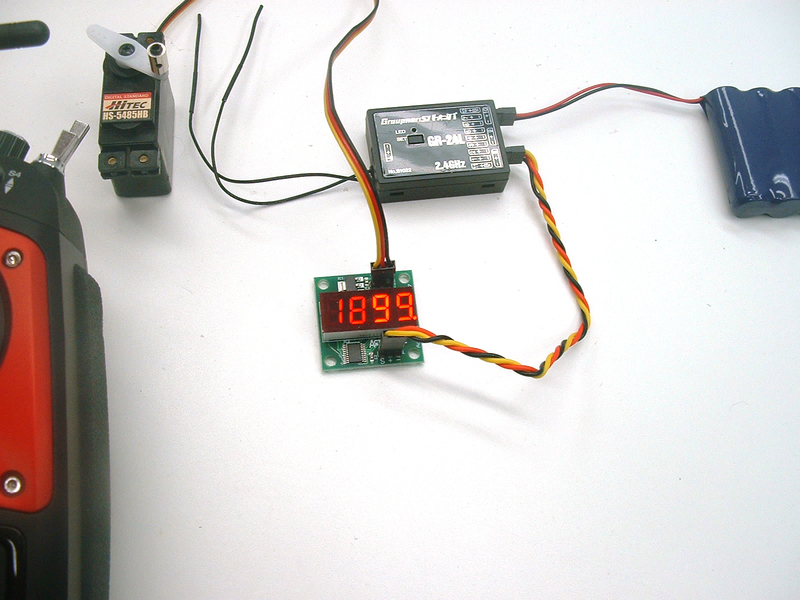 In the photos above, you can see the basic layout and operation of the PWM Meter. 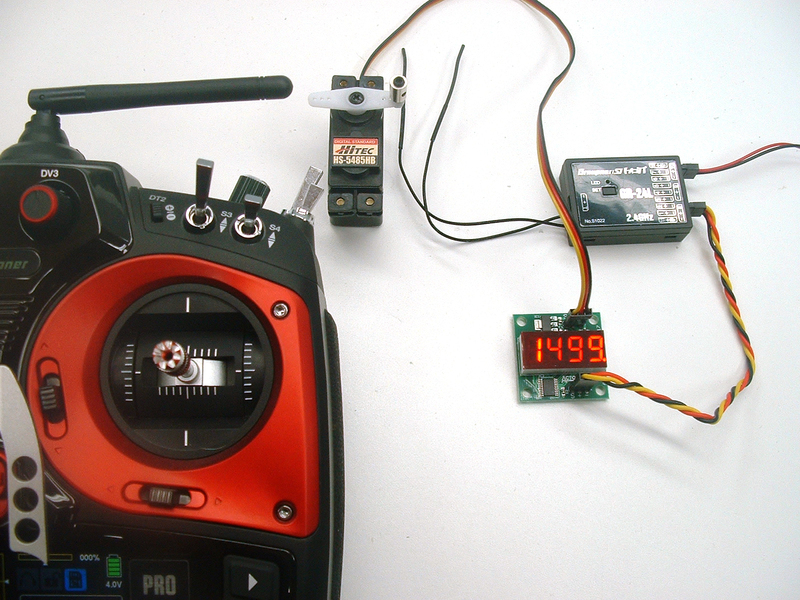 It is connected in line between the servo and the receiver. 1499 microseconds is the duty cycle for the servo at center, while 1099 and 1899 microseconds are full right and full left respectively . For this demonstration, I have a Hitec digital servo connected to the aileron channel of my Graupner GR-24L receiver, and my Graupner mz-24 PRO transmitter is sending a signal to the receiver. How Might This be Used in RC? That’s an excellent question! 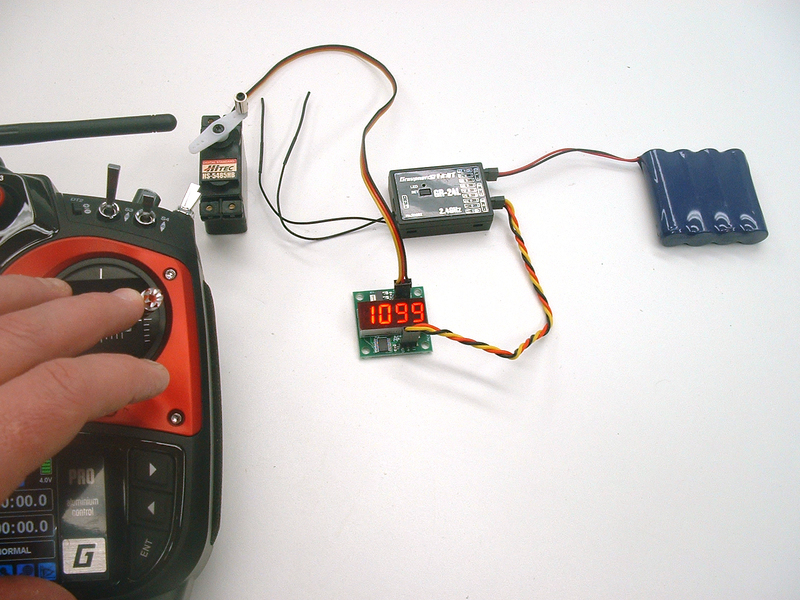 The PWM Meter can be used to verify that a receiver is sending out a correct signal to the servo. If i know the baseline numbers for a given receiver, I can test the receiver again if I believe it may not be operating properly. 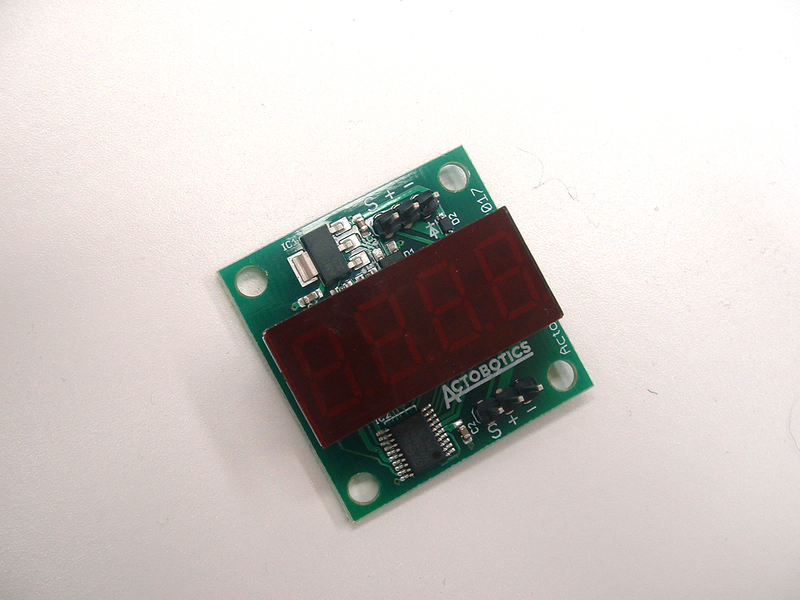 I can also use the PWM Meter to verify that a servo is operating properly – if I know the signal output from the receiver is correct, but the servo is not operating properly, the PWM Meter will verify that the servo has issues. See? I told you it would be a useful tool! Check out the video below I put together to see the PWM Meter used in a demonstration. I’ve never been ‘that guy’ that needs to have all the latest and greatest gadgets and tools. With that said, If I see a long term use for a tool, especially a tool at a decent price, I’m more than happy to pick it up. I’m thinking that this little meter will be handy the next time I’m trouble shooting a servo/receiver issue. I could have definitely used it a couple of years ago when I had a pair of brand name receivers not working properly… Thanks to Actobotics and servocity.com, I’ve now got the perfect tool for the job!